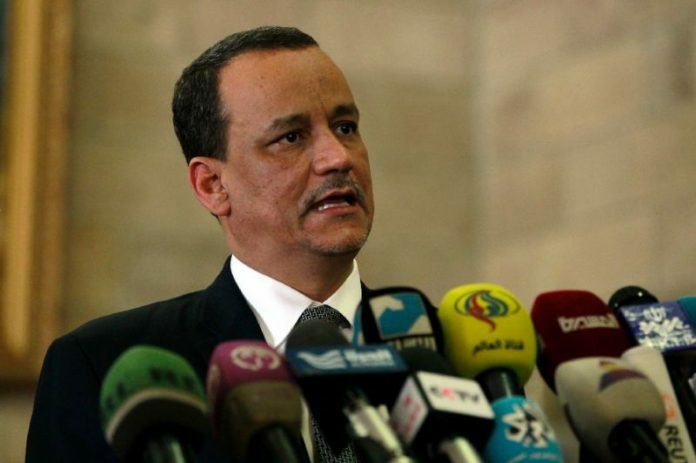 UNITED NATIONS, Oct 18 (APP): The United Nations special envoy for Yemen, Ismail Ould Cheikh Ahmed, has announced a three-day ceasefire in war-hit Yemen. Monday, the truce will begin on on Wednesday night and continue for 72 hours. “The Special Envoy welcomes the restoration of the Cessation of Hostilities, which will spare the Yemeni people further bloodshed and will allow for the expanded delivery of humanitarian assistance,” the statement said. Earlier on Monday, Yemeni Foreign Minister Abdel-Malek al-Mekhlafi said on his official Twitter feed that President Abd-Rabbu Mansour Hadi had agreed to a 72-hour ceasefire with the possibility of it being extended. the other party adheres to it, activates the DCC (De-escalation and Coordination Committee) and lifts the siege of Taiz,” he said. responsible for overseeing ceasefires in Yemen. rebels who overran Yemen’s capital, Sanaa, in 2014. Government forces maintain control of only one of four access routes. Ali Abdullah Saleh, hold most of Yemen’s northern half, while forces loyal to the Hadi share control of the rest of the country with local tribes. Saudi Foreign Minister Adel al-Jubeir said on Monday that Saudi Arabia was prepared to accept a ceasefire if the Houthis agreed to one, but that he was sceptical about peace efforts after previous ceasefire attempts failed.